The Verkhovna Rada, Ukraine's parliament, has started a plenary session on Tuesday in the morning. Some 390 MPs have registered at the sitting. 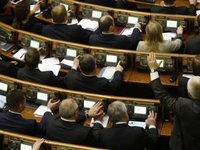 As reported, opposition deputies blocked the rostrum and presidium of parliament for nearly three weeks - from February 5 to February 22, demanding the introduction of personal voting. After it was unblocked, the parliament held one plenary meeting on February 22 and announced a break until March 5. On March 5, members of opposition factions again blocked the rostrum of the Verkhovna Rada in protest against a lawsuit in court to strip MP Serhiy Vlasenko, a defense lawyer for former Prime Minister Yulia Tymoshenko, of his parliamentary powers.